In his chapter “Hypertext and the Remediation of Print” Bolter (2001) contends that remediation is about redefining cultural perspectives (p.43). The big question between hypertext and print becomes whether one is more real, authentic, and natural than the other (Bolter, 2001, p. 43). Accustomed to the “Print Age” we are experiencing a transition to processed, electronic, and hypertext forms of writing. According to Bolter (2001) this transition has been much more hostile than the transition from writing to print. On the other hand though, he offers the argument that hypertext is actually a remediation of print rather than the end of print (p. 47). This sounds contradictory to his previous claim that this transition is hostile. Many aspects of hypertext are often taken for granted by those that have been immersed in electronic writing from the start of their literary development. 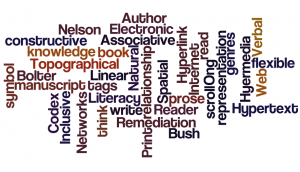 When we consider how hypertext allows for networks of communication, hyperlinks and a workable space we see that there is a change in the relationship between the author and the reader. According to Bolter (2001) when reading online we experience “ordinary text, but they also function as places along a path” (Bolter, 2001, p. 28). This provides a sense of space when reading hypertext compared to print. Before the Internet, Nelson used the term “hypertext” to describe the connections between ideas and documents that make up literature (Bolter, 2001, p. 34). Bush (1945) raised concerns regarding the amount of knowledge available and how it would be managed. Bush (1945) considered a device he called the “memex” that would be used as an interactive way to store and access information. The computer and the Internet have been used to realize the connections of the writing network. Bolter (2001) describes hypertext as if a printed book has been separated into pieces. The author is able to make meaning and connections between the smaller pieces (Bolter, 2001, p. 35). Each connection represents “paths of meaning for the author and for the reader” (bolter, 2001, p. 35). These paths along with the computer’s ability to manage the connections allow for writing that has order and is associative in nature (Bolter, 2001). Through the use of hyperlinking, electronic hypertext continues to provide challenges for the author and the reader. When choosing to hyperlink the author must work to create meaningful connections or associations for the reader. Bolter (2001) contends that hypertext is inclusive and consists of new elements that were not available to print. Bolter (2001) adds that there is no responsibility on the part of the author or the reader as neither is responsible for how the connected pathways are followed. In fact, since Bolter’s (2001) text was written, there are greater opportunities for the reader to participate in the pathways. The use of hyperlinks and hypermedia has also redefined the relationship between words and images (Bolter, 2001). When participating in the interactive space of hypertext the reader is able to respond to the work with his or her own hypertext and hypermedia. While hypertext claims to be more interactive than print, Bolter (2001) recognizes that electronic writing and hypertext “must acknowledge both their connection with and their difference from print” (p. 45). If hypertext is a remediation of print as Bolter (2001) presents, in what ways does it accomplish this? To begin hypertext is non-linear where print is considered to be a linear type of writing (Bolter, 2001). There is structure in hypertext but also through its ability to provide associations through links and hypermedia it is dynamic where print is static (Bolter, 2001). The reader is aware of their participation in the medium. In print we are not meant to consider the font, style, and the page as we read the material. We are to consider the thoughts of the author as they are being presented to us. Bolter (2001) does not mention here though that print advertisements have relied on text features for years understanding that colour and font do have an impact on the reader that the author can use to their advantage. Bolter (2001) goes on to say “hypertext uses the printed book as its object of remediation” (p. 45). The book represents print and is no longer the standard for what the current literary culture desires; which makes hypertext the next step in the evolution of literary development. Considering these changes, the claim that this remediation has been less respectful than the remediation of the manuscript is not fully presented. Bolter (2001) does point out that print has to change to compete with hypertext. The mimicked features of hypertext are even displayed in his own text when he uses a symbol (==> p. #) to create a print version of linking between ideas within his text. Given the need to stay current one might be able to see Bolter’s (2001) claim that there is hostility between hypertext and print. It must also be recognized that print is no longer separated from word processing thus print has to rely on the same technology that led to hypertext. This could appear as jealousy or contempt on the part of print. Meanwhile hypertext continues to progress possibly without even being fully aware of the pending feud. When looking at the evolution of literacy it is clear to see that hypertext is a remediation of print as Bolter (2001) states. While the print industry does struggle to compete with electronic hypertext and hypermedia it is difficult to see this as a hostile or malicious attack on print. It would appear that this is just a natural process in the development of human thought and communication. Similar to how the codex was impacted by the invention of print. As print added new features and benefits to the literary form that preceded it so is the case with hypertext. This entry was posted in Commentary 2 and tagged Bolter, Bush, hypertext, remediation. Bookmark the permalink. 5 Responses to Hypertext, a Hostile Takeover? Similar to those people who scoff at MP3s and put on their records, or sit in a comfy chair with their hand-held phone rather than running around with a blutooth, books will remain a preference for some people for a long time. But I like to think that future generations will see books as a another brick along the road, with papyrus and the rest, rather than a brutally usurped writing medium. Books certainly aren’t miniDiscs players. Thanks for your response. I see your point. It is interesting to see that some forms are making a resurgence, as is the case with vinyl. Hi Ken. Great commentary. I agree, hypertext is more of a gentle nudging than a hostile takeover. As I was reading your post I was thinking about the value of hypertext in connecting with the author’s process. If I can click on an author’s references via hyperlinks while reading the article I may be more likely to get the author’s vision in a bigger picture way. If I can follow your thoughts by following your readings/viewings I will be better able to share your thoughts with you. That is exactly how I feel. I think that the greater connection between the author and the reader allows for greater understanding on the part of both parties. Thanks for your response. Thanks for clearing up Bolter’s citation style. I couldn’t figure out what he was doing. Your commentary highlighted what I have been noticing in our texts, and particularly Bolter’s. He (and you) have anthropomorphized the relationship between text and hypertext. I think this speaks to our unease as humans with the changes that are occurring. By moving it out of our own realm and assigning human qualities to the tools we communicate with, we are better able to cope with the change.